Sunday June 23rd 1889 We got up pretty early and had breakfast as Will took Joe to the 6.25 train going east. I had enjoyed her visit all I could with the wretched way I have felt. I went to see the Dr in the forenoon. Mother went to church. Will took Adda home for good in the afternoon. I was in bed part of the time and went to bed early. Monday June 24th 1889 I did not get up till the middle of the forenoon. Mother done the work. Agnes Kelly came in the afternoon to work. 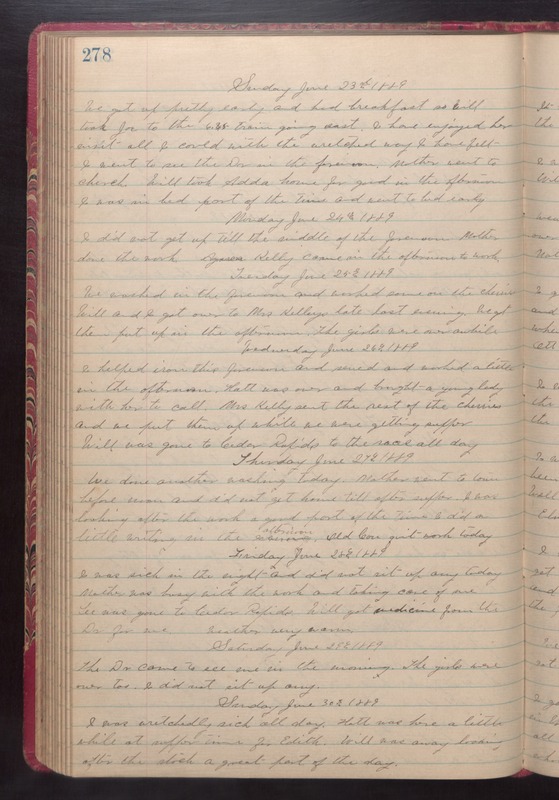 Tuesday June 25th 1889 We washed in the forenoon and worked some in the cherries. Will and I got over to Mrs Kelley's late last evening. We got them put up in the afternoon. The girls were over awhile. Wednesday June 26th 1889 I helped iron this forenoon and sewed and worked a little in the afternoon. Hattt was over and brought a young lady with her to call. Mrs. Kelly sent the rest of the cherries and we put them up while we were getting supper. Will was gone to Cedar Rapids to the races all day. Thursday June 27th 1889 We done another washing today. Mother went to town before noon and did not get home till after supper. I was looking after the work a good part of the time. I did a little writing in the afternoon. Old Con quit work today. Friday June 28th 1889 I was sick in the night and did not sit up any today. Mother was busy with the work and taking care of me Lee was gone to Cedar Rapids. Will got medicine from the Dr for me. weather very warm. Saturday June 29th 1889 I was wretchedly sick all day. Hatt was here a little while at supper time for Edith. Will was away looking after the stock a great part of the day.